Mon-El first arrives on Earth suffering from amnesia during Superboy's time in Smallville. 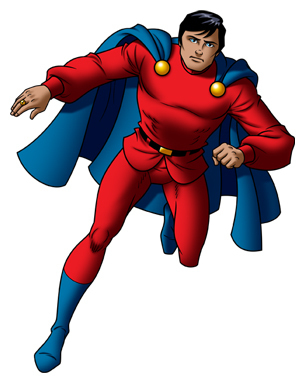 Mistakenly believing he is from Krypton, Mon-El is originally thought of as "Superboy's Big Brother" (SB No. 89, Feb 1961). However, with his memory restored, Superboy and Mon-El discover that he is actually a native of the planet Daxam, a Krypton-like world, and like Superboy, Mon-El has super powers under a yellow sun. He however had an encounter with Jor-El when arrived on Krypton shortly before the planet's destruction. The scientist warned Mon-El of the impending explosion and he escaped with a map to Earth, but fell into suspended animation in the trip until he arrived. A Daxamite's one weakness is lead, which is abundant on Earth. Unlike exposure to Kryptonite in Superboy's case, lead exposure to a Daxamite is fatal. To save his friend's life, Superboy projects Mon-El into the Phantom Zone. Mon-El remains trapped in that twilight dimension for over a thousand years until Brainiac 5 of the Legion of Super-Heroes concocts a final antidote for Mon-El's lead poisioning. Fully cured, Mon-El becomes a member of that heroic teen brigade of the future, the Legion of Super-Heroes. When Superman visits the Adult Legion of Super-Heroes, he learns that Mon-El was roaming the spaceways as an explorer, clearing the way for intergalactic settlers. This page was last modified on 17 May 2010, at 14:45.